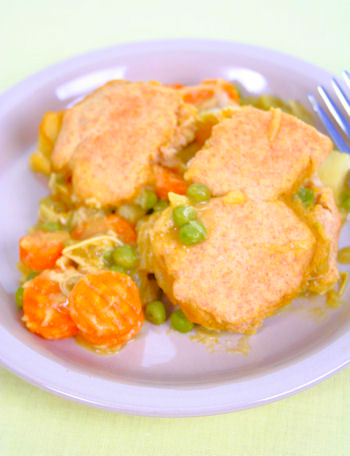 Admittedly this vegan chicken pot pie recipe has a long list of ingredients, but trust me, it's worth it. This recipe took a long time for me to get exactly right. If I didn't think it needed the ingredient I wouldn't have put it in. Want to know what others thought about this recipe? Would you like to comment on this recipe? Go to the Chick Pot Pie blog entry. Prepare the hearts of palm by cutting them in half, slicing half way into the hearts and slide your finger into the slice and pull out the tender middle of the hearts, shred them with your fingers. Put the outside of the hearts in a plastic bag and smash them with a rolling pin to soften them up. Set aside. In a large heavy pot, saute onions and celery with the butter on medium heat until onions are transparent. In the same pot add hearts of palm and soy sauce and cook about 3 minutes more. Add 3 cups of water, onion and garlic powder, seasoned salt, pepper, potatoes and carrots. 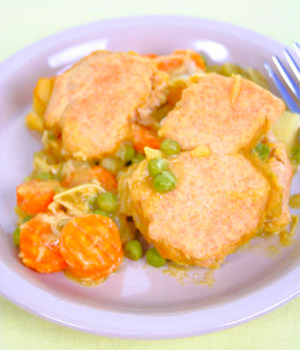 Cover and cook on medium heat until potatoes and carrots are almost tender, Add green peas. Then cook until potatoes and carrots are done. While potatoes and carrots are cooking... in a food processor put chickpeas with liquid, cumin, coriander, turmeric, nutritional yeast and corn starch. Process until liquefied. Pour into the pot with other ingredients and remove from heat. Spray 8X8 glass casserole dish with non-stick cooking spray. Pour ingredients from pot into baking dish. Mix all-purpose and whole wheat flour, corn meal, sugar, baking powder and salt together in a mixing bowl. In a separate small bowl mix together rice milk, vinegar and oil. Then join the wet and dry ingredients together and stir. Drop batter by the spoonfuls, the size of biscuits on top. Spray top with non-stick cooking spray. Place in oven and cook for 10 or 15 minutes or until top is lightly brown.